Every family is different, aren’t they? Different lifestyles, different priorities, different philosophies, different goals, different values…in my opinion, all these differences are what keep the world an interesting place! And it’s because of all these differences that we’ve structured The Baby Sleep Site in the way that we have. If you’ve been a reader for long, then you know that we have all kinds of different resources available. Lots of those resources are what we call ‘do-it-yourself’ resources – they are designed to give you tips, techniques, and tools that you can put to use on your own, in order to solve your baby’s sleep problems. But we have another kind of resource, too, and it’s a truly unique one. For parents who don’t want a ‘do-it-yourself’ approach, we offer our consultation services. Our consultation services allow parents to work directly with a trained sleep consultant – the consultant crafts a Personalized Sleep Plan™ and then helps the parents implement it at home. While mom and dad are still doing the ‘work’ of sleep coaching, they have the support and guidance of the consultant, and if changes need to be made to the plan, or if bumps in the road come along, the consultant is there to show mom and dad what to do next. Sometimes, parents have a hard time knowing which ‘path’ is right for them – do they take the ‘do-it-yourself’ path, or do they opt for the ‘personalized help’ path? The answer is different for different families, of course, but we can usually tell which families will be able to get by on their own, and which families will likely end up needing personalized help. And that’s the topic of today’s article – 7 reasons you may need personalized help. Remember, this isn’t prescriptive – YOU get to determine what kind of help you need, not me! You know what’s best for your baby and for your family. 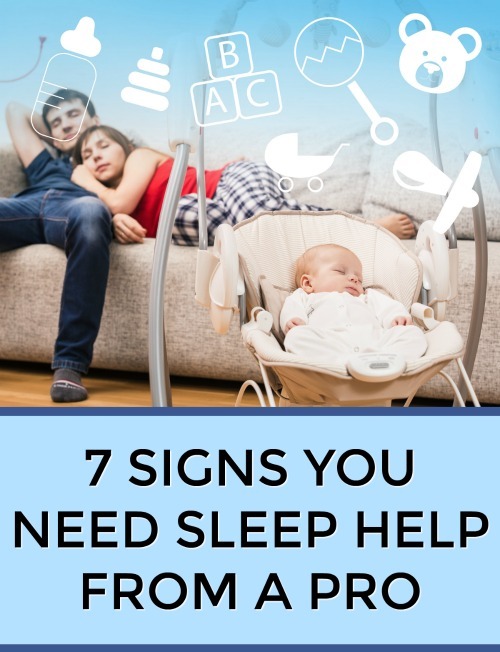 🙂 Rather, this list is meant to be a help to those families who want to work on sleep but don’t know where to start, or who are struggling with their babies’ or toddlers’ sleep and don’t know what to try next. Your baby or toddler has medical concerns – If your baby or toddler has health or medical concerns, you might want to consider getting personalized help. Little ones with medical issues often need a customized sleep coaching plan that takes into account their unique health needs, and is created with a healthcare provider’s recommendations in mind. Your family has a unique lifestyle – Not every parent works a 9-5 schedule, and not every family lives in a traditional home. Our work with families over the years has shown us that there are as many ways to live as there are families under the sun! We’ve worked with parents who do shift work, families who live in multi-generational homes, families who travel overseas on a regular basis…you name it! And in unique situations like these, personalized help can be a real life-saver for parents. It makes a world of difference to have a sleep consultant understand your unique lifestyle and make sleep recommendations that will work with that lifestyle. You have twins or multiples – The traditional wisdom about baby sleep coaching definitely needs to be tweaked and modified for families who have twins or multiples! The basics still apply, of course, but when you have two babies waking each other up, or who are operating on different schedules, it helps to have a consultant standing by who can put a personalized spin on those sleep training basics. You want to keep breastfeeding during sleep coaching, but have concerns – Breastfeeding and sleep coaching really can go together, as we have explained before. But if you have any breastfeeding issues that may impact sleep training, or if you are concerned about your milk supply during the sleep coaching process, then it may be a good idea to go with personalized help. A sleep consultant can take your current feeding schedule into account when developing your Personalized Sleep Plan®, and can make recommendations that will improve sleep while also ensuring that you are able to continue breastfeeding easily. Your toddler has significant sleep issues, and has had them since birth – This is not to say that parents of toddlers can’t solve their sleep issues without help – in some cases, they can! It’s just that it tends to be harder to sleep coach a toddler. Why? Because toddlers can walk and talk – and because they tend to have very strong wills! This means that in addition to all the work of sleep coaching, parents of toddlers often have a battle of wills to deal with, when they begin to work on their toddlers’ sleep. Plus, if your toddler has had napping issues and night-waking problems since birth, she’s had plenty of time to form deeply-ingrained sleep habits, and those can be tough to break. Toddler sleep coaching also tends to take a little longer than baby sleep coaching. For all these reasons, it may take a consultant helping you along through the process, and providing support and encouragement, in order to see real progress with your toddler’s sleep. You are committed to using a no-cry or low-cry sleep training approach – Again, sometimes, parents are able to sleep train on their own, using no-cry or low-cry approaches. But using gentle methods like these tends to be more involved for parents – there’s more ‘work’ to do, in some ways. And gentle methods typically take longer to produce results. For these reasons, parents can quickly become discouraged when using gentle methods, and can feel like all their effort is for nothing. In cases like these, personalized help from a consultant can make all the difference. A consultant can customize a no-cry or low-cry plan to fit your goals, and then can help you make adjustments to it as necessary. Plus, there’s as lot to be said for having someone you can just vent to, and who will listen and sympathize and encourage you! You have already read/tried everything, and nothing has worked – You’d be surprised how many of the families we work with fall into this category. We always say our clients are a smart bunch – usually, by the time they come to us for help, they’ve done quite a bit of sleep research already! Unfortunately, though, having loads of information doesn’t always mean that sleep coaching will be easy. If you feel like you’re at your wits end and have tried everything you can without success, you may want to consider personalized help. A consultant will be able to organize the information for you in a new way, and will provide a fresh perspective on your particular situation. And that can make all the difference. Ready to get personalized help for your baby or toddler’s sleep? Our sleep consultants are standing by! Browse our list of consultation package options, make your choice, and after you purchase, you will immediately receive an e-mail with your Helpdesk login information. You’ll be able to login and start your Family Sleep History form right away – it’s that simple! How are you tackling (or how have you tackled) sleep coaching in your family? Do-It-Yourself, or With Personalized Help? Have any questions about getting personalized help for your baby? Share them in the comments section below! My daughter is 2 years old. As I breast fed her it became a habit that she would fall asleep in my arms and even though she now has cows milk in a bottle she still does this. If I try any other way we just have a night of hell as she is relentless!! From the day she was born she has suffered with wind and. She would barely go down & even now she can’t seem to pass any without waking us all up! She is fine in the day though. She goes to sleep ok after her bedtime routine of dinner about 5.30 – 6pm, then bath about 6.45pm and bed 7.30-8.30pm but then wakes up around 11/12 then about every 3-4 hours after that. She has a sip of water then straight back down. @ Corrine – sounds like she has some strong sleep associations with waking up to nurse that have really stuck around! Have you tried our free toddler guide yet? It’s called Toddler Sleep Secrets, and it’s free to download; might be a really great help to you! It definitely addresses how to handle persistent sleep associations. Best of luck to your family, Corinne! @ Shelby – oh, no…sounds like you’re struggling 🙁 Have you thought about upgrading to a sleep plan? The Express Sleep Plan™ gives more personalized guidance than the e-book, since it’s customized, and our Personalized Sleep Plan™ packages put you in touch with a trained sleep consultant who can help pinpoint where things are going wrong, and can write up custom recommendations for you. Why don’t you email contact (at) babysleepsite (dot) com and ask them for recommendations, given what you’ve already purchased and what you’re still facing? We definitely want to make sure you end up rested! @ Nikki — woohoo! We love hearing from repeat customers like you 🙂 Thanks for taking the time to chime in!! @ Joanna C — well, 5 out of 7 is a pretty clear indicator! That’s exactly why I wrote this post – Nicole and I thought it would be helpful to explain really clearly and definitively what, in our experience, makes it necessary for some families to get personalized help, while other families can get by with a do-it-yourself solution. It’s not that you can’t overcome some of these hurdles on your own, but overcoming 5 of them by yourself would likely send you over the edge, stress-wise! Thanks for commenting, Joanna. Hope you are able to connect with a consultant and get the help (and no doubt the SLEEP!) that you and your daughter need. Best of luck to you! @ Kimberly – this sounds so rough! I’m so sorry you’re dealing with this 🙁 As for what to do — it sounds like your son probably has some really strong sleep associations, given that he’s slept through the night just a few times in the past 8 months. The nursing to sleep is probably one, and sleeping in your arms may be another. The key is to help break those sleep associations, so that your son learns to fall asleep on his own. This is much easier said than done, however! Have you considered a personalized consultation before? You can take a look at all of our packages here: https://www.babysleepsite.com/baby-toddler-sleep-consulting-services/ This would allow you to work one-on-one with a consultant, who would walk you through the process. Having that kind of support and guidance is so helpful! I have an 8-month old where I could count on one hand how many times he has slept through the night. He seems to have extreme separation anxiety at night. He will only fall asleep if he is nursing or if he is clinging to mine or my husband’s face. We took the mattress out of his crib and put it on the floor of our room so he could have his own space, but could still be cuddled to sleep. We have tried letting him cry and this results into hysterics and he is screaming for up to an hour straight before I give in and nurse him back to sleep. When he falls asleep it is only for about 2 hours before he is screaming again. We try to put him down around 7 every night and sometimes he goes down easily, others he will fuss for 45 minutes plus. Any ideas?